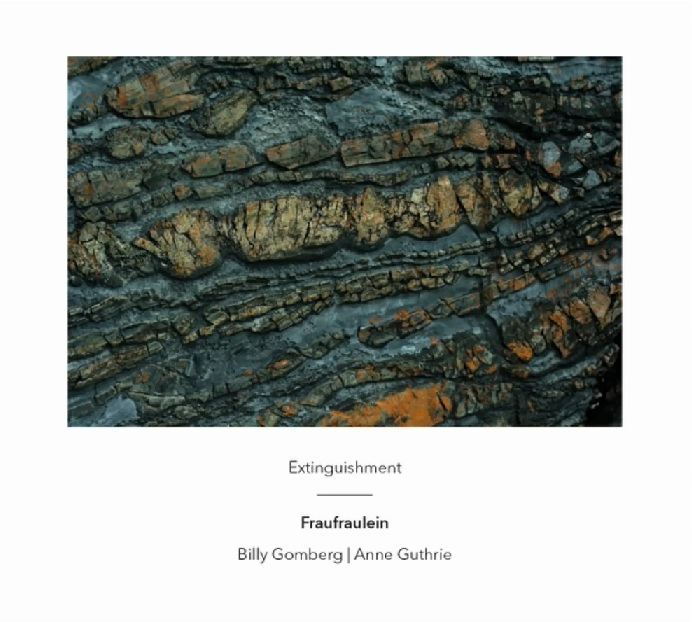 Anne Guthrie and Billy Gomberg have been playing together as Fraufraulein for years now, and have recorded a number of albums, but this is my first encounter with the duo. Guthrie is a French horn player, Gomberg plays bass guitar, and both musicians also work with field recordings and electronics. According to an informative interview, Extinguishment is based on improvised performances, collaging together studio sessions with live recordings from a 2014 tour and other materials. The result is a rewarding album that deals in some interesting, at times surprising ways with sounds and textures that are somewhat familiar from the last decade-plus of improvised music. Extinguishment is at its strongest when the duo overturn expectations, inserting sounds and ideas that complicate the music’s underlying textures, disrupting the momentum of their own pieces in surprising ways. This happens most prominently and dramatically on the first of the three tracks here, “Convention of Moss.” For the first seven minutes of the piece, the duo builds a rather steady sonic world: electronic crackle, piercing feedback tones, recordings of murmured speech and movement buried in the background, the occasional recognizable tone from Guthrie’s horn. Gradually, some more prominent recorded speech enters the mix, and then the speech segues into choral singing and music, ebbing and receding, with the sample at its loudest nearly blotting out the underlying sustained horn sounds and electronic hiss. This fragment was apparently recorded by Guthrie at a Hungarian festival in New York, and its presence here – without ornamentation, simply juxtaposed with the other materials – substantially changes the flow of the music. The duo’s careful creation of an insular soundscape is disrupted, invaded by a foreign musical conception, taking what had been maybe a little overly familiar – but enjoyably dense and detailed – electroacoustic improv and shaking it apart. In the last couple of minutes of the piece, after the Hungarian recording fades away, the music splinters, collapsing into quiet, discrete events, very different from the carpet-like electronic layers of the rest of the track. There’s a collision of musical worlds and also a collision of approaches, with the composed-ness of the field recording insertion interacting with the underlying improvisations. The improvising musicians seem to be reacting to an event that – if I’m hearing/interpreting this correctly – was not actually part of the original performance, but layered in later. The insertion of the recording is in one sense a simple additive gesture, but it greatly complicates and deepens the music, creating some fruitful tensions. The remainder of the album doesn’t have anything quite so bracingly overt, but the afterimage of this first track’s climax lingers over the rest of the disc’s length. Moreover, the two other pieces here are similarly enriched by the subtle interactions between the various materials and approaches present in the duo’s music. The second track, “Whalebone In a Treeless Landscape,” opens with more recognizable horn playing from Guthrie, as she plays low, mournful tones against a minimal backdrop of bass rumble, the occasional plucked or scraped string from Gomberg, and small clattering noises. Soon, the music settles into bassy, droney territory, with Guthrie’s horn vanishing and later re-emerging, more subtly, as fluttery pulsations within the electronic buzz or foghorn-like blurts above it. The piece maintains a steady, hushed, slightly eerie aura – a dim high-frequency tone hovers just at the edge of hearing in the background throughout much of the piece – even while the musicians gradually change elements in and out. The overall atmosphere is constant but the building blocks are cycling throughout, from the French horn and electronics of the opening minutes, slowly introducing field recordings, then shifting the palette more towards fuzzy electronic textures, with the horn and the blurry place recordings reappearing. Throughout, the volume level remains low and the different elements simply contribute to the sense of a time-suspended stasis, gray and melancholy. The effect is subtle, easy to miss, but striking when discovered: like looking at a seemingly blank wall from afar only to discover, upon closer inspection, all the complexity of the wall’s pock marks, paint trickles, and textural gradations. The final track (“My Left Hand, Your Right Hand”) again opens in a mournful mood, as a desolate melody is juxtaposed against flickering, high-pitched electronic tones. The source of the melody is a little ambiguous, at least to me; swathed in distortion, it at times seems to be coming from the French horn, but at other times it sounds, hauntingly, like Guthrie is actually singing. After a few minutes, the mood changes as Guthrie begins playing the simple, sing-song melody more forcefully through her horn, presumably with some kind of processing or extension of the instrument itself, since her playing sounds buzzy and echoey, as though resonating from a great distance. As the electronics similarly swell and beef up to match her playing – which now sounds more angry than it does sad – the duo switches things up again. Field recordings (another public space filled with blurred voices) are introduced into the mix and the distorted horn gives way to a few whispery, breathy interjections that blend into the recordings. The resulting second half of the piece is quite dynamic and intense. Once again, the duo displays a subtle ability to create shifts and fissures within the music, as various layers of sound accumulate and weave together, their sources mysterious: hints of voices, electronic drones, traffic noises, thumps and clatter, subtle melodic undercurrents that lap against the edges of the more abrasive elements. The various layers are perfectly balanced and incredibly dense, creating the impression that different sounds and sources are interacting without ever quite resolving where the various sounds belong in the piece’s structure. Apparently, somewhere in there is a live recording that features flautist Robbie Lee playing with the duo, but it’s difficult to identify any concrete elements like that within the sedimentary layers of the music. The density of such moments is what makes Extinguishment work so well. Guthrie and Gomberg are, to a degree, working with a palette that’s become familiar from countless other musicians working similar territory over the last 15 years, but the ways in which they play with structure and layering prevent their music from ever being predictable or stale. This is subtle, often deliberately unassuming music. The duo does not come towards the listener on this album, instead simply presenting a trio of insular, self-contained worlds that only reveal most of their (considerable) pleasures to listeners willing to step forward into the music and hear what’s there. This entry was posted in 2015, eai and tagged Anne Guthrie, Another Timbre, Billy Gomberg, Fraufraulein. Bookmark the permalink.